This week has been CRAZY. I arrived in Philly with 3 of our designers on Sunday at midnight, installed a super pretty house we've been working on, and was home by Tuesday evening. We had electricians, handymen, landscapers, and movers there all at once. Thankfully, it came together smoothly (as smooth as installs can go at least), but now I'm exhausted! And then we launched our 2nd webisode! We go into more detail in the video, but basically our client has this beautiful mountainside home that just needed some updating. Since we weren't gutting the entire house it was important to blend styles and a streamlined-traditional look fit the bill perfectly. We started with the kitchen which already had a good layout, but needed a major refresh. 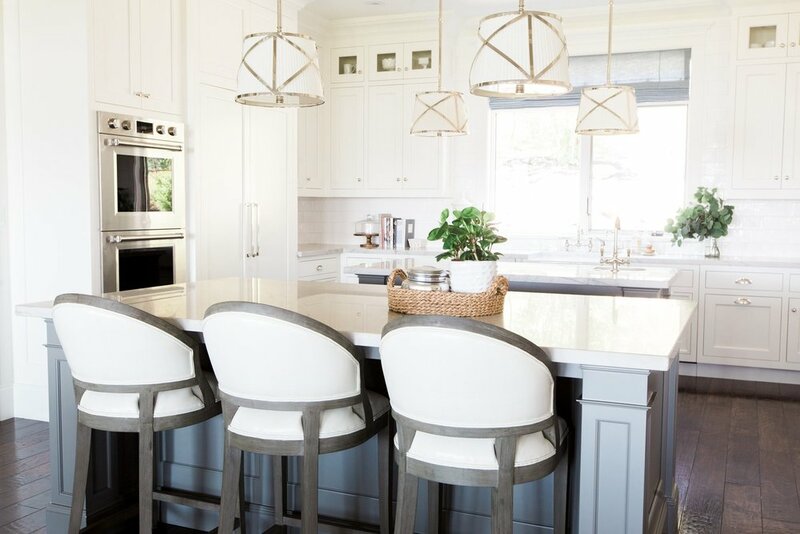 We used 'Swiss Coffee' by Benjamin Moore on the surrounding cabinetry and 'Chelsea Gray' on the islands. Our client fell in love with this quartzite for it's beautiful gray tone, pronounced veining, and durability. It's not cheap, but it's a natural stone that is much hardier than marble! At first our client didn't want to paint the walls and trim, but with a little convincing they decided to go with it, and we're so glad they did! It turned out so great and is one of the biggest ways you can make an impact in your home. 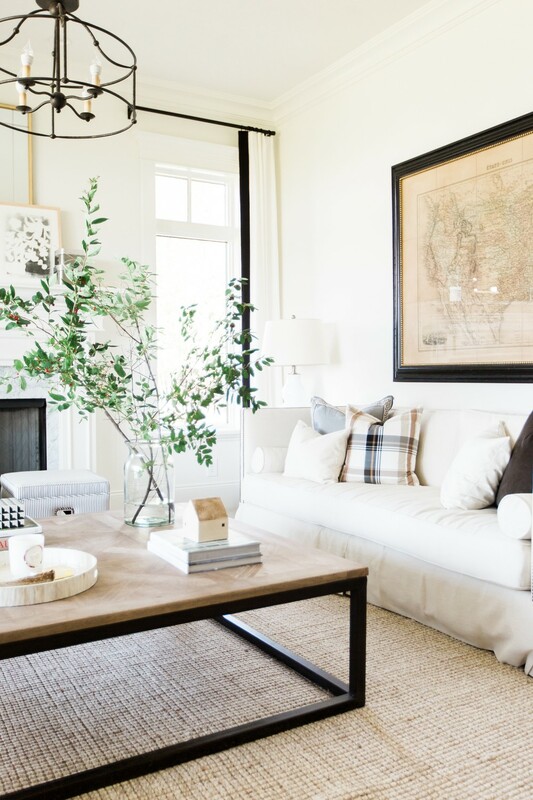 In the living room we took off the heavy dark shutters and kept to a really neutral and restrained color palette. It gives the room a calmness you can feel the instant you walk in. We love putting a room with really light walls next to a room with really dark walls. We did just that in the formal sitting room with this charcoal metallic grass cloth wallpaper. The formal sitting room is also the perfect place to use a really light sofa since you won't use it as much. 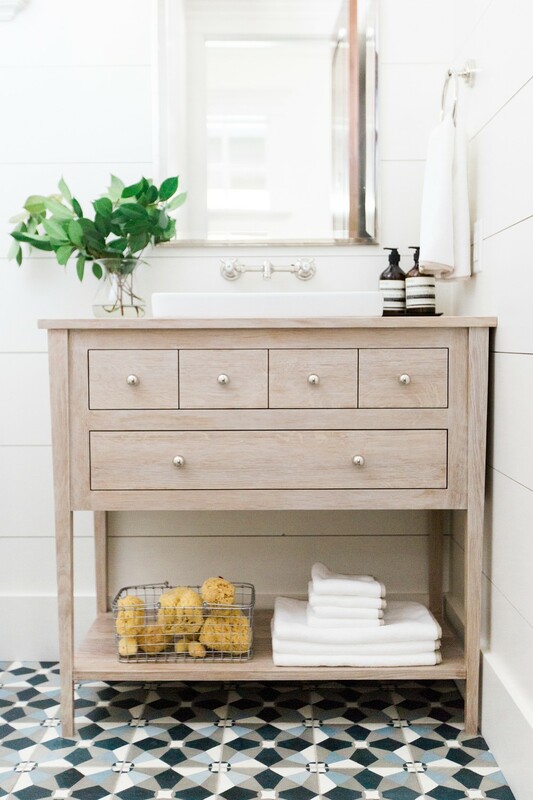 In the bathroom we designed this white oak cabinet with polished nickel pulls. It pairs perfectly with the different blues tones in the cement tile. Our favorite part though is the 10 inch shiplap that we did, instead of the usual 5-6 inches.